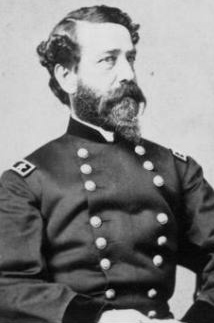 Brigadier-General John Milton Brannan, U.S. Army (public domain). Saint John’s River, Fla., October 4, 1862. GENERAL: In accordance with your instructions I arrived within the bar of this river on the afternoon of the 1st of the present month, and the same night effected a landing at a place known as Mayport Mills. I afterward established a position on Mount Pleasant Creek, though with great difficulty, owing to the swampy nature of the country and the number of unfordable creeks intersecting it. On our first arrival in the river of the rebels, as far as I could ascertain, received re-enforcements, making their garrison in Saint John’s Bluff batteries about 1,200 infantry and cavalry, with a light battery of eight guns, in addition to the heavy armament of the batteries. I further learned that they were momentarily expecting re-inforcements [sic] from Georgia. On the 1st instant the gunboats made a reconnaissance on the river, and were immediately and warmly engaged by the batteries on Saint John’s Bluff, on which they withdrew. However yesterday, the 3d instant, on making a further reconnaissance, the batteries were found to have been evacuated by the rebels. I immediately advanced from my position on Mount Pleasant Creek and occupied the batteries and late camps of the enemy. The batteries, which are skillfully constructed, well armed, and well supplied with ammunition appear to have been deserted in great haste, the guns being all mounted, loaded, and in good condition, the ammunition served, and everything in excellent fighting order, I am in fact utterly at a loss to account for this sudden evacuation on the part of the rebels, as, in addition to a most skillfully constructed line of defense, the position possesses natural advantages which render it almost impregnable, and, with the number of men which I know to have occupied it, the position might have been maintained for a considerable time and the task of reducing it rendered one of extreme difficulty and danger to a much larger force than I had at my disposal. In advancing to Mount Pleasant Creek our pickets had some skirmishing with the rebels, indeed, during our entire advance to Saint John’s Bluff the guerrillas continued to show themselves in the woods, and occasionally to fire at us, even after the evacuation of the batteries. They, however, did us no injury. On the 2d instant a scouting party of the Forty-seventh Regiment Pennsylvania Volunteers, under Captain Keck, of that regiment, surprised a camp of the rebels, taking some camp equipage and about sixty stand of arms of all descriptions, but chiefly rifles. The men effected their escape, having horses and being much favored by the intricate nature of the ground. I am much indebted to the gunboats, Captain Steedman, U.S. Navy, in command, for the prompt and energetic manner in which they assisted at the disembarkation of the troops, and the valuable assistance rendered by their howitzers in covering the landing and advance of the infantry. On leaving this point it is my intention to blow up the magazines and utterly destroy the works on Saint John’s Bluff, and I am at present engaged in removing the guns, which I propose to take with me, they being of considerable value, their number and caliber and follows, viz: Two 8-inch columbiads, two 8-inch guns, smooth bore, two 8-inch howitzers, and two 4.6-inch rifled guns. I return the transport Cosmopolitan, and respectfully request that I may receive her rations for my command for ten days from the 10th instant, as it will yet take me some time to complete my work on this river. Owing to information received yesterday, the 3d instant, as to the strength of the enemy, I deemed it expedient, on consultation with Captain Steedman, U.S. Navy, commanding gunboats, to send the Cosmopolitan to Fernandina, Fla., and to call on that garrison for reinforcements to my command. This call Colonel Rich, Ninth Regiment Maine Volunteers, commanding, promptly answered to, by sending 300 men, who arrived early this morning. The occasion for which they were required, however, having passed, I sent them back per this ship. The gunboats proceeded up the river yesterday and will return this afternoon. Captain Steedman, who has just returned, states that there is much corn on the bank of the river. This I propose to take with me, if possible; if not, to destroy it. He (Captain Steedman) was informed that three Georgia regiments were to have arrived at Jacksonville this morning; but in consequence of the evacuation were ordered back. Comdg. Department of the South, Hilton Head, S.C.
Steamship Ben De Ford, October 13, 1862. COLONEL: In accordance with orders received from headquarters Department of the South, I assumed command of the following forces intended to operate against the rebel batteries at Saint John’s Bluff and such other parts of the Saint John’s River as should contain rebel works: The Forty-seventh Regiment Pennsylvania Volunteers, Col. T. H. Good, effective strength 825; Seventh Regiment Connecticut Volunteers, Col. Joseph R. Hawley, effective strength 647; section of First Connecticut Light Battery, Lieutenant Cannon, effective strength 41; detachment of first Massachusetts Cavalry, Captain Case, effective strength 60. Total, 1,573. The expedition left Hilton Head, S.C., on the afternoon of September 30, on the transports Ben De Ford, Boston, Cosmopolitan, and Neptune, and arrived off the bar of Saint John’s River early on the following morning (October 1), but was unable to enter the river until 2 p.m. the same day, owing to the shallowness of the channel. This expedition was joined by the following fleet of gunboats, Capt. Charles Steedman, U.S. Navy, commanding, ordered to co-operate with it: Paul Jones, flag-ship; Cimarron, Captain Woodhull; Water Witch, Lieutenant-Commander Pendergrast; Hale, Lieutenant-Commander Snell; Uncas, Lieutenant-Commander, Crane; Patroon, Lieutenant-Commander Uran. On the expedition coming within the river three gunboats were sent up to feel the position of the enemy and were immediately and warmly engaged by the batteries, apparently of heavy armament, on Saint John’s Bluff. A landing was effected at a place known as Mayport Mills, a short distance from the entrance of the river, and the entire troops, with their arms, horses, and rations, were on shore by 9 o’clock on the night of the 1st. The country between this point and Saint John’s Bluff presented great difficulties in the transportation of troops, being intersected with impassable swamps and unfordable creeks, and presenting the alternative of a march, without land transportation, of nearly 40 miles, to turn the head of the creek, or to reland [sic] up the river at a strongly guarded position of the enemy. On further investigation of the locality a landing was effected for the infantry about 2 o’clock on the morning of the 2d at a place known as Buckhorn Creek, between Pablo and Mount Pleasant Creeks; but, owing to the swampy nature of the ground, it was found impracticable to land the cavalry and artillery at that point. Here the gunboats rendered most valuable assistance, by transporting the troops in their boats and in sending their light howitzers to cover their landing. Col. T. H. Good, with the entire infantry and the marine howitzers, was ordered to proceed immediately to the head of Mount Pleasant Creek, and there establish a position to cover the landing of the cavalry and artillery. This movement was executed with great promptness and skill, surprising and putting to flight the rebel pickets on that creek. Indeed, the landing of the troops at Buckhorn Creek and their rapid movements on Mount Pleasant Creek proved to be most fortunate for us, such a proceeding being so unexpected on the part of the enemy as entirely to disarrange any plans they may have formed to prevent our landing. The pickets retired in such haste and trepidation as to leave their camps standing, their arms, and even a great portion of their wearing apparel behind them, and then men themselves may thank the intricate nature of the ground, together with their superior knowledge of a country almost impracticable to a stranger, that they effected their escape. On the afternoon of the 3d the command of artillery and infantry was in position at the head of Mount Pleasant Creek, distant about 2 miles from the enemy’s works on Saint John’s Bluff. Here the statements of those belonging to the locality, though conflicting and unreliable in the extreme, appeared to agree in placing the strength of the rebels at 1,200 cavalry and infantry, in addition to the heavy batteries, which they represented as containing nine heavy pieces, two of them being columbiads. Under these circumstances I deemed it expedient, on consultation with Captain Steedman, U.S. Navy, commanding naval forces, to call upon the garrison of Fernandina for re-inforcements [sic]. To this call Colonel Rich, Ninth Regiment Maine Volunteers, commanding that garrison, responded promptly by sending 300 men early on the following morning. Later on that day, from further information received, Captain Steedman, at my request, sent three gunboats to feel the position of the rebels, shelling them as they advanced, when the batteries were found to be evacuated; after which Lieutenant Snell, U.S. Navy, sent a boat ashore and raised the American flag, finding the rebel flag in the battery. The U.S. steamer Water Witch retaining possession of the batteries until the arrival of the land forces, the command immediately advanced from the position on Mount Pleasant Creek and occupied the batteries and late camp of the enemy. At about 8 o’clock on the evening of the 3d the cavalry, not having landed with the portion of the troops, were here disembarked. I found the late position of the enemy on Saint John’s Bluff to be one of great strength, and possessing a heavy and effective armament, with a good supply of ammunition, as will be seen by the accompanying inventory of ordnance captured – the works being most skillfully and carefully constructed and the position greatly enhanced by the natural advantages of the ground, it being approachable from the land by but one route, which would lead the attacking party through a winding ravine immediately under the guns of the position, and from the narrowness of the channel at this point and the elevation of the bluff rendering the fighting of the gunboats most difficult and dangerous. Most of the guns were mounted on a complete traverse circle, and indeed, taking everything into consideration, I have no doubt but that a small party of determined men could have maintained this position for a considerable time against even a larger force than was at my disposal. On the day following my occupation of these works (October 4) I proceeded to dismount the guns and to remove them and the ammunition on board the transport Neptune, which work was completed on the 7th, when I forwarded them to Hilton Head, and caused the magazines to be blown up, and otherwise destroyed the entire works on the bluff. On first occupying the bluff Captain Steedman, with his gunboat, proceeded immediately to Jacksonville for the purpose of destroying all boats and otherwise intercepting the passage of the rebel troops across the river. On the 5th, leaving the work of removing the guns from Saint John’s Bluff to Col. T. H. Good, Forty-seventh Regiment Pennsylvania Volunteers, my second in command, I proceeded up the river as far as Jacksonville in the transport Ben De Ford with 785 infantry. I observed a large quantity of corn and other crops on the banks of the river, which it was at first my intention either to remove or destroy. This purpose I afterward abandoned as impracticable, not having either forces or transportation sufficient to remove it and seeing from the communication of the major-general commanding that he did not desire the delay necessary to destroy it. The rebels had a light battery of eight pieces and a position in readiness to receive seven heavy guns at a place called Yellow Bluff, which they appear to have lately evacuated. Jacksonville I found to be nearly deserted, there being but a small portion of its inhabitants left – chiefly old men, women, and children. On our first arrival some few rebel cavalry were hovering around the town, but they immediately retired on my establishing a picket line. From this town and its neighborhood I bring with me several refugees and about 276 contrabands, including men, women, and children. On the 6th, hearing that some rebel steamers were secreted in the creeks up river, I sent the Darlington, with 100 men of the Forty-seventh Regiment Pennsylvania Volunteers, in charge of Captain Yard, with two 24-pounder light howitzers and a crew of 25 men, all under the command of Lieutenant Williams, U.S. Navy, and a convoy of gunboats, to cut them out. This party returned on the morning of the 9th with a rebel steamer, Governor Milton, which they captured in a creek about 230 miles up the river and about 27 miles from the town of Enterprise. Lieutenant Bacon, my aide-de-camp, accompanied the expedition. Finding that the Cosmopolitan, which had been sent to Hilton Head for provisions, had so injured herself in returning across the bar as to be temporarily unfit for service, I sent the Seventh Regiment Connecticut Volunteers to Hilton head by the steamer Boston on the afternoon of the 7th instant, with the request that she might be returned, to assist in the transportation to Hilton Head of the remaining portion of my command. On the return of the successful expedition after the rebel steamers, on the 9th I proceeded with that portion of my command to Saint John’s Bluff, awaiting the return of the Boston. On the 11th instant I embarked the section of the First Connecticut Light Battery, with their guns, horses, &c., and one company of the Forty-Seventh Regiment Pennsylvania Volunteers, on board the steamer Darlington, sending them to Hilton Head via Fernandina, Fla. On the 11th, the Boston having returned, I embarked myself, with the last remaining portion of my command, except one company of the Forty-seventh Pennsylvania Volunteers, left to assist and protect the Cosmopolitan, for Hilton Head, S.C., on the 12th instant, and arrived at that place on the 13th instant. The captured steamer Governor Milton I left in charge of Captain Steedman, U.S. Navy. It is evident that the troops in this portion of the country, from their being in separate and distinct companies, have not sufficient organization or determination to attempt to sustain any one position; but seem rather to devote themselves to a system of guerrilla warfare, as was exemplified in our advance on Saint John’ Bluff, where, even after the evacuation of the fort, they continued to appear on our flank and in our front, but, as they seemed to fear a too near approach, their fire was never effective. The gunboats rendered great and valuable assistance during this expedition, and high praise is due to their commander, Capt. Charles Steedman, U.S. Navy, for the prompt and energetic manner in which he entered into every scheme for the reduction of the enemy and the destruction of their works and the zeal and activity with which he personally superintended every detail of his portion of the duties and further, for his generous assistance in relieving the transport Cosmopolitan. I ascertained at Jacksonville that the enemy commenced evacuating the Bluff immediately after the surprise of their pickets near Mount Pleasant Creek, on the 3d instant. It affords me pleasure to state that the most perfect harmony and good feeling existed between the two branches of the service in every respect, doubtless owing to the gallant and gentlemanly conduct of the commander of the naval forces. The troops under my command showed great energy, zeal, and activity, and a desire to meet the enemy; but the latter were too fleet for them. I doubt not they will give a good account of themselves when the opportunity affords. I am much indebted to my staff, Capt. L. J. Lambert, assistant adjutant general; Capt. I Coryell, assistant quartermaster, and Lieuts. J. V. Germain and G. W. Bacon, aides-de-camp, for their zeal, energy, and attention to their duties during the entire expedition, particularly the three latter officers, who were always ready at all times for any duty. To Captain Coryell, assistant quartermaster, the Quartermaster’s Department owes much for his untiring energy and activity in giving his valuable assistance to the transport Cosmopolitan after her accident. I am also under obligation to Capt. A. P. Rockwell, First Connecticut Light Battery, who acted as additional aide-de-camp, and to the officers of the Signal Corps, Lieuts. G. H. Hill and F. E. Town, who performed their duties with great satisfaction to me and the expedition. Asst. Adjt. Gen., Dept. of the South, Hilton Head, S.C.
Reports of Brig. Gen. John M. Brannan, U.S. Army, commanding expedition, in Official Records of the Union and Confederate Armies, 1861-1865 (Microfilm M262). Washington, D.C.: U.S. National Archives and Records Administration.